Barisal Division is in Bangladesh. 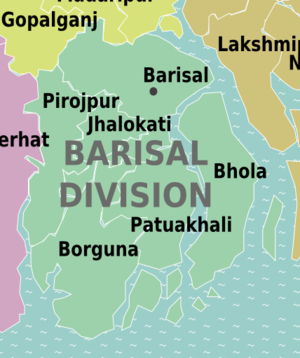 During the Pakistan period Barisal division was a district under the same name and was part of Khulna Division then as one of four divisions of East Pakistan. The far most reliable way to get in from other parts of Bangladesh are medium sized ships locally known as launches.There are Three classes : Floor, Rooms and VIP rooms. Floors are the cheapest with around 200 taka and is slightly like camping. People are sheltered under the deck like a roof on a veranda. Rooms and VIP rooms are more expensive and contain more luxuries like air conditioning and television. It is recommended to carry 15000 taka for these. However you have to still know Bangla. The food onboard can upset the stomach so people should carry their own food. This page was last edited on 10 July 2017, at 14:28.